We're excited to announce that Paul Vincent, service technician in Idaho Falls, has received his Ricoh Prestige Certification! Fewer than 50 dealerships nationwide can claim a Prestige Certified technician and we are proud to be one of them. This certification is only given to service professionals who demonstrate resourcefulness, exceptional levels of knowledge and technical proficiency, and an innovative approach to problem solving. This year more than 2,000 techs nationwide qualified to be tested. Only the top 90% of level one test takers were invited to take the second level test. The second test had a pass rate of less than 9%. At the end of this rigorous process, 137 of the nation’s best service techs were awarded Ricoh's Prestige Award — the highest recognition for service excellence. Just 46 of the 406 companies that participated in the Service Excellence process had a technician receive the “Prestige” certification. 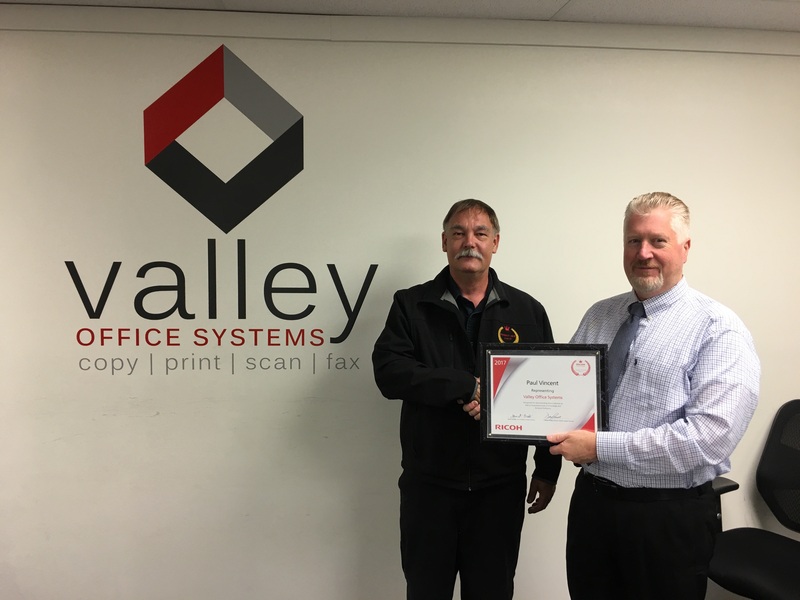 Valley Office Systems’ motto has always been “A Service Company Above All Else”, and currently employs over 80 very talented individuals throughout all of our locations and continues to grow both in number of employees and in service area. Paul's achievement is the most recent one in a long string of awards. We are proud winners of The Ricoh Service Excellence Award, four years running. We're the only dealer in Idaho and Utah to receive this award. We've also been recognized by Sharp as a Hyakuman Kai Dealer, a status given to oustanding dealers. To learn more about our awards, click here. Want to experience our award winning service for your self? Contact us today.